We play for the residents on the viola da gambas (viols) and on the lutes with much concentration, by which such a rest comes that people feel confident. After playing Leonoor goes to everyone individual with the small viola da gamba or the small lute and makes people feel that they, by relaxing their hand or arm, can make beautiful tones. People who can hardly move anymore appear to be able to relax so much with help and much patience that they are able to pluck or bow on the small viola da gamba (viol) or the small lute. Beautiful stories come about what people experienced in their lives or they tell about their experiences with music. People really get happy of personal attention. At the end we sing the song Live together, sing together on the melody of Brother John. Je bent nooit te oud om te leren (You are never too old to learn) is our last project, musical encounters in elderly people's homes in Utrecht, IJsselstein, Harmelen, Vleuten, Bilthoven and Amsterdam and music lessons for independent living seniors in the community center in our district Lombok, see the link above. This project took place from 19 December 2011 up to and including 1 November 2013. K.F. Hein Fonds, € 3.000. 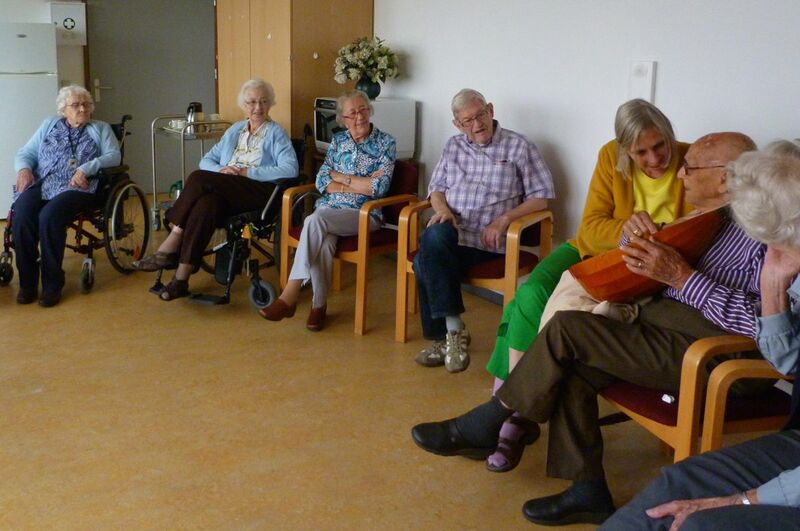 Fonds voor Cultuurparticipatie considered our music project for seniors as a pilot project. This means that extra attention was given to our project on the website of the foundation. Muziek maken doe je samen (Make music together), a project with 48 musical encounters in five residential homes for the elderly in Bilthoven, IJsselstein, Zeist and Utrecht since May 2011, with subsidy from RCOAK and Fonds Sluyterman van Loo, see the links above. Muziek dichtbij (Music close to you), a project for elderly people in nursing homes and residential homes for the elderly. From 16 March up to and including 16 November 2010 we provided for 59 musical encounters for and with seniors in living rooms of nursing homes and residential homes for the elderly in and around Utrecht. We received subsidy for this project from K.F. Hein Fonds and Fonds Sluyterman van Loo, see the links above.